As age comes as a gift that some never receive, we tend to cast backward glances more and more. We all have origins somewhere. We’re all connected to others. It is said that we can choose our friends, but not our family. Truer words were never spoken. Our sibling relationships are often primary in our development as functionally dysfunctional members of society. I grew up with two older sisters, a younger brother and sister—I was smack-dab in the middle. We were typically competitive and usually ready to scrap or laugh with each other on a moment’s notice. 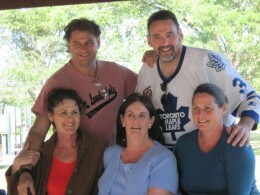 The picture, taken in the summer of 2010, is the last time the five of us were together, kicking our way through the 21st century. Age gathers on all of us and life unfolds across the miles, which in introspective moments, causes me to wonder if perchance it could be the last snapshot of us. If so, in my life, I’ve loved them all. The collection available on this tab will be stories and remembrances from times and places that no longer exist—it’s mostly for my children and grandchildren to have a record of ancient history, but the essays ought to also conjure up good memories for those who grew up in a long ago and faraway reality.